“…The devil does not intend to allow this testimony about Christ. He devotes all his energy to opposing it and will not desist until he has struck it down and suppressed it. In this respect, we humans are weak and stubbornly perverse and are more likely to become attached to saints than to Christ. Within the papacy they have preached about the service rendered by these beloved saints, that one ought to rely on their merit. And I, too, believed and preached thus. St. Ann was my idol, and St. Thomas my apostle. I patterned myself substantially after them. Others ran to St. James and strongly believed and firmly trusted that, if they conformed, they would received all they wished and hoped for. Prayers were said to St. Barbara and St. Christopher in order to avert an early and sudden death, and there was no uncertainty here. So completely is man by nature bent on renouncing this testimony of John the Baptist. For this reason it is necessary constantly to persevere and adhere to John’s testimony concerning Christ. For it requires toil and effort to continue with word and testimony, for a person at death to be able to say, I must die, but I have a Savior concerning whom John the Baptist testifies; on him and on no other creature, either in heaven or on earth, do I rely. However, that a person can die as cheerfully by believing in St. Barbara, in an indulgence, or in a pilgrimage to Rome, as in the man to whom alone John the Baptist points, is out of the question. Also, that a person can build as strongly on monkery or monastery life as on holy baptism is a forlorn hope. 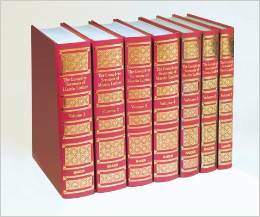 Quotes are excerpted from volume five of Luther’s 7-volume set of sermons (page 79). This entry was posted in Jesus Christ, Salvation. Bookmark the permalink.